FugginSuggin.com: Have You Ever Wondered Where The Other Teams "Champions" T-Shirts Go? Have You Ever Wondered Where The Other Teams "Champions" T-Shirts Go? If you're in Haiti, you may think that the Colts were victorious in this year's Super Bowl. 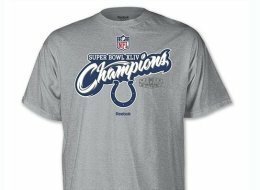 That is because the NFL has teamed up with World Vision to provide the pre-made, loser's Super Bowl "Champion" T-shirts to earthquake damaged Haiti.